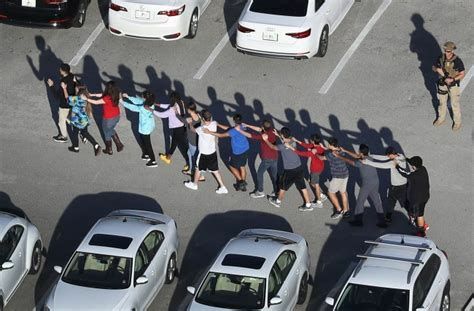 Students from Marjory Stoneman Douglas High in Parkland, Fla. leave the school single file following the school shooting recently. Since that event, schools across the country have been on high alert due in part to many copycat social media threats. McALLEN — Echoes of the most recent mass shooting at a Parkland, Fla., high school continue to resonate throughout the Rio Grande Valley with students and parents voicing increased concerns over continuous threats circulating mainly via social media platforms. School district officials and local law enforcement officers have seen an increase in the number of threats of similar violent attacks being reported. While these reports are encouraged and have in several instances resulted in the arrest of students, school and law enforcement officers are working to spread several messages starting with the serious consequences of posting such threats and the need for people to think before they share to avoid unnecessary panic. It’s easy to simply repost or share a social media threat in efforts to warn the public in general, but it is also easy to misinterpret and create widespread panic. Some of the most recent threats that both law enforcement and school officials have been made aware of and asked to investigate have turned out to be posts from other states. Fear created by these posts push parents to not only become hesitant about sending their child to school but to distrust school officials. Many request information that cannot be shared by district or law enforcement during early stages of an investigation and also undermine the outcome of the investigation itself, Verley said. One of the first steps on the law enforcement side is to identify who made the threat and when, said San Juan Police Department Chief Juan Gonzalez. This also involves making sure that a social media post was not taken out of context if this wasn’t a direct and blatant warning. Once the threat is verified, then the appropriate measures are taken. These can range from arrest, to suspension, expulsion or, in the cases of minor suspicion of danger, home visits where school officials and police officers talk to parents about potential dangers and try to identify corrective or preventive measures. These processes vary from district to district or city to city, but these are some of the ideas being shared among police departments and school districts, Gonzalez said, as they maintain constant communication due to the close proximity to each other in the Valley. Gonzalez said he believes law enforcement in general lets many families down during the attack in Florida, as there were many clear red flags that went unnoticed. But he said he wants to reassure parents that local agencies are working together to regain that trust and be on top of any sign of malicious intent. His department, for example, recently created a new position in which an investigator monitors, identifies and investigates possible threats throughout social media platforms. This is being viewed now as a permanent role within the department that will evolve with the ever-changing technology used to spread these messages. Their partner district, PSJA, also created this position in response to the increase in reports, King confirmed. At the Mission school district they recently hired a coordinator for safety and security who acts as a liaison between the district and the police department when this collaboration is necessary. Both Gonzalez and Mission Police Department Lt. Jody Tittle said they would like parents and students to make an effort to trust that appropriate measures are being taken with every report and that they would not keep students in school if there weren’t safety precautions in place. There are constant safety and security measures being taken in most school districts not only to avoid or properly respond to dangerous situations including a possible active shooter, said Mission school district interim Superintendent Criselda Valdez, but the responsibility has to be shared.